In the last tutorial we explored Kalman filter and how to build kalman filter using pykalman python library. In this section we will be dealing with python com server to integrate Amibroker + Python to compute Kalman Filter and Unscented Kalman Filter Mean Estimation and plot the same in Amibroker. The Kalman Filter and Unscented Kalman Filter is a unsupervised algorithm for tracking a single object in a continuous state space. Given a sequence of noisy measurements, the Kalman Filter is able to recover the “true state” of the underling object being tracked. The difference between kalman and unscented kalman filter is that while the Kalman Filter restricts dynamics to affine functions, the Unscented Kalman Filter is designed to operate under arbitrary dynamics. Pandas – Python Data Analysis and Data structure Library(to handle time series data). 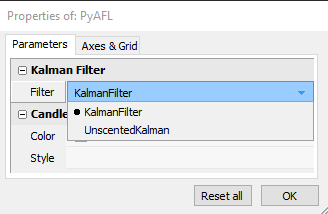 PyKalman – Library to compute Kalman Filter and Unscented Kalman Filter. Since Kalman Filter is a statistical model it is relatively difficult to code in AFL Programming Language and hence we rely on Amibroker with Python COM Server and relative python libraries which ease our work. Price data is sent from Amibroker to Python Com Server and then Python does the kalman filter computations and returns back to Amibroker. 4)Open a New Blank Chart and apply PyAFL – Kalman Filter.afl to it. 5)Now right click over the charts -> goto parameters and change between Kalman and UnScented Kalman to compute the relevant statistical tool. Thanks Ranjadran, really very good posts dealing with Python integration. 1. I used your IIR filter as you describe it, but initially got error from Python as the module “pythoncom” was not present. After some googling found that that module comes with the package pywin32 (sourceforge.net/projects/pywin32/files/pywin32). I installed it and followed the rest of your instructions and worked like a charm. My first question is to check if this was the right thing to do or do you have a “complete package” that can be deployed for your posts about this subject. 2. Secondly I tried your kalmar filters, but then again got compiling errors registering the py file. This time the module not present in my system is Pandas. Again, after some googling I see this is a separate package but rather more complicated to install that pywin32 (it is suggested to use Anaconda). May you please give advice in how to proceed? I will check the videos. I started from scratch, and noticed that activepyhton 2.7.13.2714 already install most of the libraries you mentioned. Could you please shed some light here? Thank you very much for this interesting tutorial which allows me to make my first steps with Python. I have to say that I have had some hard times to install all the Python dependancies with the correct versions and bitness. Nevertheless, at the end, I succeed to run the “python pykalman.py” command and to get the magical words “Registering COMserver / Registered: PyKalman”. Then, I jumped to Amibroker and open enthusiastically the afl code. To my big disapointment, Amibroker immediately shutdown without any error message. I repeat the operations and always obtain the same behaviour. I have also tested your IIR code with the same result. I am using Amibroker 6.19. I have slightly corrected your kalman afl code (using the IIR example) by adding “price = nz(price);” to avoid any null value. Do you have any idea on what happened? Hi Rajandran thx for the instruction how to use python in AB. I was succesfull installing the Pycoint sample. But for the Kalmann I always receive the following error “COM error: sour python com server intertal error description: Unexpeced Python Error: TypeError: Internal error -- the buffer length is not the sequence lengt! Cound it be an python 3.6 error since you created it for 2.x?